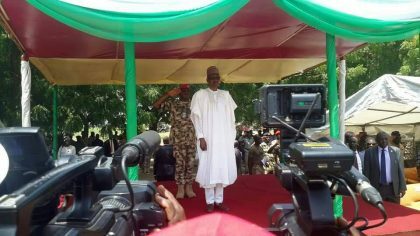 Isa Gusau, Maiduguri: President Muhammadu Buhari on Sunday marked the 57th Independence anniversary in Maiduguri, with visit to troops of Operation Lafiya Dole involved in the fight against Boko Haram in Borno State. The President was received on arrival, by Borno Governor, Kashim Shettima alongside Service Chiefs led by the Chief of Defence Staff.‎ His plane landed at the Nigerian Air Force based in Maiduguri from where the President and Governor Shettima boarded a waiting chopper to the Parade Ground of Maimalari Army Cantonment where a joint military outfit, codenamed ‘Operation Lafiya Dole’ as well as the 7th Division of the Nigerian Army both have their operational headquarters. The President inspected a guard of Honour and parade by troops before addressing soldiers, policemen and paramilitary personnel involved in fighting Boko Haram in Borno State. In his address, Buhari said the efforts put in place by security forces in sustaining peace, unity and progress of Nigeria as an indivisible country is highly commendable.‎ He pledged Federal Government’s continuous support for troops of ‘Operation Lafiya Dole’ to end lingering crisis of insurgents and terrorism in the north east. “We are here today in Borno State to interact with you (troops) and to celebrate the 57th Independence Day Anniversary. I want to commend you for your sacrifices in the fight against insurgents. I am here as a morale booster and i assure you that we will continue to do our best to support you in the frontline and end all forms of terrorism in our dear country. We as government will continue to improve on the economy to create jobs for the teaming youths. We are also determined to Kick Corruption out of this country. I was a state governor sometimes ago and Borno was my base. At that time, nobody thought Borno would witness any crisis, but i want to reiterate that we will do our best to restore peace in any part of this great country” the President said. After addressing the troops, the President cut the Anniversary Cake and interacted with soldiers wounded in action including Sergeants Owen Eze who was shot on the neck during an operation in Gwoza Operational. Earlier in his welcome address, Chief of Defence Staff, General Abayomi Olonisakin appreciated President Buhari for his decision to celebrate the 57th Independence Anniversary with gallant troops who have all sacrificed their lives in the fight against Boko Haram Sect. “This visit by Mr. President is really a morale booster to us on the frontline. In the last two years, the people in the northeast witnessed series of wanton killings and destruction of properties by insurgents, but we are glad for the relative peace being enjoyed now. And this could not have been achieve without the tremendous support we have been recieving from Mr. President”Olonisakin said. Heads of security establishments present during the President’s visit include the Chief of Army Staff, Lt. General Tukur Buratai, Chiefs of Air and Naval Staff, Air Marshall Abubakar Sadique and Vice Admiral Ibok-Ette Ibas, the Director General of the Department of State Services, Alhaji Lawal Daura among others.